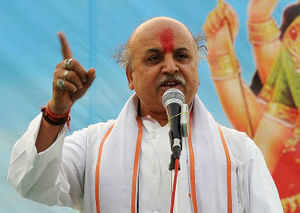 RAJKOT: Vishwa Hindu Parishad’s (VHP) president Pravin Togadia sent temperatures soaring in Bhavnagar on Saturday evening with a hate speech that targeted Muslims for buying properties in Hindu areas. At night, Togadia joined a group of VHP and Bajrang Dal members on a street protest outside a house purchased by a Muslim businessman near Meghani Circle. While saffron groups have been regularly organizing ‘Ram Dhuns’ and ‘Ram Darbars’ to thwart such deals, Togadia went a step further by asking the protesters to take complete control of the house and put a ‘Bajrang Dal’ board on it. Togadia told the gathering that there were two ways to stop such deals. One is to pressurize the state government to bring in Disturbed Areas Act in Bhavnagar, which prevents inter-community sale of immovable property. The second is to take forcible possession of the house and fight a legal battle later which will go on for years. He gave the Muslim occupant 48 hours to vacate the house. “If he does not relent, go with stones, tyres and tomatoes to his office. There is nothing wrong in it. Killers of Rajiv Gandhi have not been hanged … there is nothing to fear and the case will go on,” Togadia told the charged-up gathering. “I have done it in the past and Muslims have lost both property and money,” he said. He also said that this election is the best time to pressurize political parties to ensure safety of Hindus. “Don’t be reluctant to pressurize Congress or BJP for the sake of Hindus’ safety,” he said. After the event was over, tension was palpable and police feared that the mob might attack the house. A team of policemen has been stationed outside the house to avert any trouble.